Something happened recently that made me feel like I had been punched in the gut. The situation wasn’t even about me. I knew I needed to be strong for others involved, but it hurt. Sometimes all you can do is pray. However, when prayer is all you can do, prayer is enough. So I’ve been alone with God. Yesterday, the Lord began to blow the fresh wind of the Holy Spirit into my spirit. He restored my joy, and I know that it’s going to be all right. Have you ever been in a situation like that? If so, what do you do? How do you respond? How do you get through what you’re going through, so you can have the Holy Spirit’s fresh wind in your sails? 1. Keep your eyes on Jesus, not on the situation. This is huge. Hebrews 12:1-2 tells us that we need to keep our eyes on Jesus as we run our race, no matter what. When we focus in on Jesus, our perspective changes. We get Heaven’s perspective, instead of man’s perspective. Heaven’s perspective will always be better. Jesus is the Way, the Truth, and the Life. Only Jesus’ perspective matters. If we want to get through what we’re going through–especially with joy–we need to love righteousness. That means we make sure we’re right with God first and foremost. It means we carefully weigh our actions and words. It means we don’t cross over into sin–whether that sin be gossip, doubt, unbelief, slander, or betrayal. No matter what you’re going through, are you right with God? Getting–and staying–right with God is the key to everything. So from this day forward, make the decision that you’re going to be right with God, no matter what. Ask Him for His help. He’ll help you and keep you. Whenever anything bad happens, our natural habit is to react, not respond. “Reacting” means acting however your flesh wants to act as soon as you get the news. “Responding,” however, is a careful, purposeful action you take after you’ve asked God how He wants you to handle it. We need to learn to respond, not react. When I got bad news recently, all I could think was: “God, we do not know what to do, but our eyes are on You” (from 2 Chronicles 20:12). I had no idea what to do or say. So I sat back and looked at God, and waited to hear and see how He wanted me to respond. I haven’t always done that, though. I thank God that He gave me the grace to do that this time. In the past, there have been many times when I would have just gone off in my flesh–and would have regretted it later. It’s our job as followers of Christ to see with God’s eyes, hear with His ears, and understand with His heart. So whatever you are going through, before you allow yourself to do, say, or think anything, I encourage you to sit back, look at the Lord, and get His instructions and perspective. Doing so will totally change your ability to walk through the situation in victory. 4. Speak life into the situation. Jesus came that we might have life, and have it more abundantly (John 10:10). If we are to be like Jesus, then imparting abundant life into everyone we encounter, everywhere we go, must be our goal. Speaking words of death and destruction is something the enemy would have you do. Speaking such words prophesies doom into people and situations. Death and destruction are the enemy’s job… not yours. Your job is to speak words of life. When you feel like you’ve been punched in the gut, if you’ve taken the time to get God’s perspective, then He will give you His words to say. His words will encourage. His words will edify. His words will build up. Remember that it’s the Holy Spirit’s job to fix things, and the Holy Spirit is very good at His job. Back off; you and I are not Holy Spirit, Junior. But you and I ARE–or are supposed to be–the embodiment of Christ on the earth. Being the embodiment of Christ on the earth means that we must impart life. We must encourage. We must release the Presence of God everywhere we go. It means we see the good in situations, even when no one else does. We see the treasure in people, even when no one else does. Always remember that our Papa God sees the end from the beginning. Jesus issued a memo on the cross that said: “It is finished.” With His life, death, resurrection, and declaration, Jesus vanquished death, hell, sin, and the grave. I’ve seen the end of the Book, and it says that God wins. So our troubles are temporary. Our situations are fleeting. God is still in control. He is both the Victor and the Victory. He is King of Kings and Lord of Lords, and we can trust Him. So let Him handle the tough work. You just impart life. Love people. Speak God’s words, and only His words. 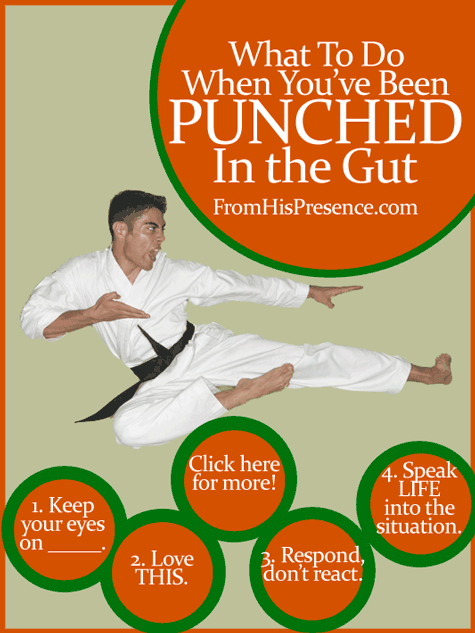 When you feel like you’ve been punched in the gut, it can be hard to handle. But if you will keep your eyes on Jesus, stay (or get) right with God, measure your response carefully, and speak only life into the situation, God can work with that. He will come to your rescue. Every time. What else can you think of that helps you stay on track when you feel like you’ve been punched in the gut? Please leave your ideas in the comments below! Jamie! 🙂 Tears…. Thanking you for this post…. I have the hardest time doing this alone. I surround myself with Godly friends and /or my husband and together we pray for guidance. IF ONE STAY ON HIS KNEES IN THE SECRET PLACE NOTHING CAN ENTER NO FEAR DOUBT SICKNESS WORRY HAS…….TO FLEE IN JESUS NAME! THE LORD IS SAYING COME AWAY HIDE IN MY SECRET PLACE. BLESS YOU. I needed this so badly today, right now. Sharing it would be a kind of acting out and showing someone how much they hurt me so I won’t share today. 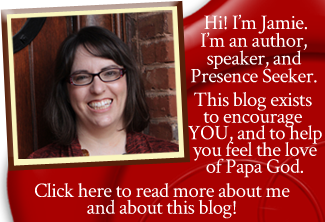 Thank you Jamie for this link & the Word of Papa God…even though I don’t always comment on your posts, they are really helping me through some difficult times at the moment, I feel He is working through you to help me…thank you so much…? Thankyou. This is beautiful. Peace of Christ to you. So glad it blessed you, Kate. Thank you for reading. I pray our Papa would strengthen and encourage you today in any area you may have a need. God has given me grace to think about the “right” thing to do, what would honor Him? My flesh screams one thing, but He is whispering the solution. So much as I don’t necessarily like it, I go ahead and choose to honor Him in the situation. That’s grace at work helping me make the right decision. I have also found that I can make better decisions in the hard times when I have had extra sleep and rest! Then I am more likely to let me emotions settle down and tell my flesh to be quiet. It’s a tough thing, Leah. For me, the comfort is in knowing that He promises to raise us up after we get through the storm. “Unless a grain of wheat falls to the ground and dies, it abides alone… but if it dies, it bears much fruit.” I know Papa will reward you for your choice to obey Him! Jamie: I’ve been going through some tough times. I believe in trusting God, but sometimes I just loose sight on how to do it. Your post on “When you feel like you’ve been punched in the gut” was so relevant that it felt like God was leading you to guide me! You gave me some guidance that was sorely needed. Thank you for your wise words. Matilde, I’m so glad Papa used this post to help you. Whenever you’re in doubt about what to do, I would encourage you to claim the promise of Psalm 32:8 in your prayers: “I will instruct you and teach you in the way you shall go; I will guide you with My eye.” I love that Scripture and I pray it all the time. I don’t think any of us could get through this life alone. Life is just too much. May our Papa bless and encourage you today! This something I needed to hear this!! I’m sorry you’ve been punched, but I pray Papa would give you loads of grace to get through it with flying colors, Linda! Wow! You posted this first years ago, and now it’s reposted right when I needed it! Thank you Lord! And thank you Jamie! I have been divorce for about 6 years. Now and for some reason. I am feeling my mind is in torment about it alot . I don’t know why I just feel so lost in my feeling now .. He is a very good person but not saved yet . He lives in another state now and we don’t have contact with each other hardly . I have been asking God to please help me to know what His will is in it all . I just feel so lost sometimes . I don’t know rather to let go of this and move on in life or what . Thank you so so much for your prayers . God Bless you always !